CMF was part of the project design team that included McCarthy Building Companies, Inc., Torrance Memorial representatives, HMC (architect), KPFF (structural engineer) and other invited project subcontractors for the 390,000 S/F new Main Patient Tower at Torrance Memorial Medical Center. 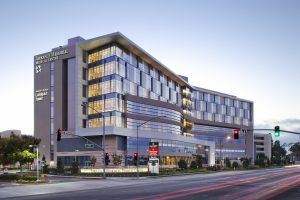 CMF supplied and installed aluminum composite panel and metal flush panel systems requiring interface with pre-cast concrete panels, unitized window systems and structural components to meet strict OSHPD seismic requirements. The main goal was to ensure an operable hospital after a large seismic event. The complex building skin interfaces challenged all subcontractors to meet the design intent and still meet the stringent mechanical requirements.